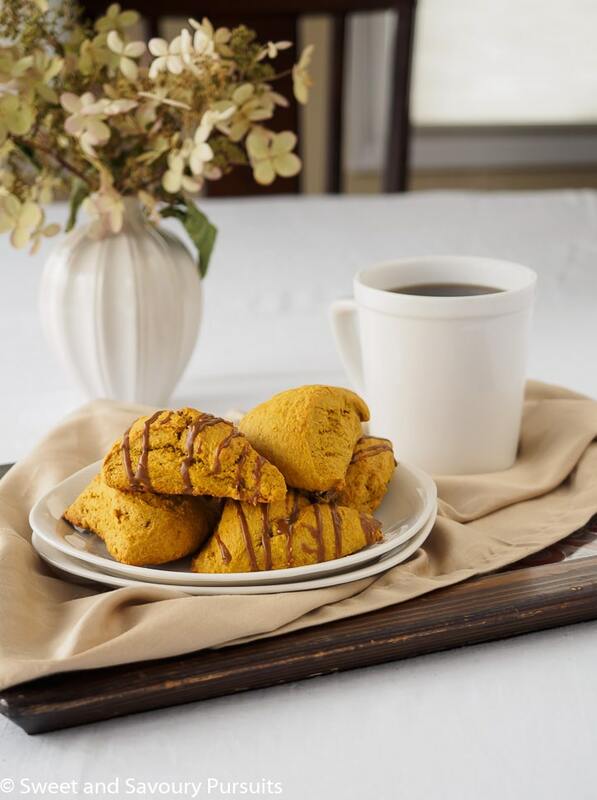 These delicious Pumpkin Scones with Espresso Glaze are light, tender and buttery just the way scones should be! Though I just posted a recipe for pumpkin muffins last week, I couldn’t resist making some pumpkin scones and since they’re so delicious I had to share the recipe with you. I spiced these pumpkin scones with cinnamon, ginger and cloves and sweetened them with some brown sugar. I topped them with an espresso glaze that complements the spices and pumpkin perfectly. The flavour of the glaze is pretty strong so in order to avoid having it overpower the pumpkin flavour and to keep the scones from being overly sweet, I chose to just drizzle the glaze over the scones. You can omit the glaze if you prefer them plain. 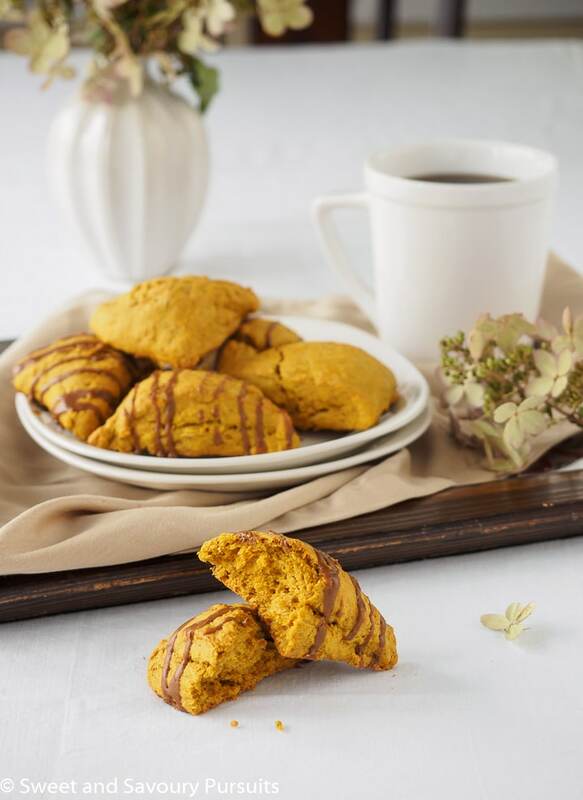 These pumpkin scones are easily made in the food processor but you can make them by hand as well. A few of things to remember while making them is that you should use very cold butter, add the liquid a little at a time (because you might not need it all), and don’t over-mix the dough or you will have tough scones. The glaze can be quickly prepared while the scones are baking. When the scones are ready, let them cool for a few minutes and then drizzle them with a bit of the espresso glaze. Scones taste best while still slightly warm so make sure to enjoy one before the scones have completely cooled. Place a rack in the middle of the oven and preheat the oven to 400°F. In a medium bowl combine the flour, cinnamon, ginger, cloves, baking powder, baking soda and salt. Pour the dry ingredients in the bowl of your food processor fitted with the steel blade. Add the pieces of butter to the food processor, and pulse until the mixture resembles coarse meal (crumbly with little pieces of butter in it). In a small bowl, beat together the pumpkin purée, brown sugar and buttermilk. Pour the pumpkin mixture into the bowl of the food processor and pulse until the dough comes together. Lightly flour your countertop. Dump the dough onto your countertop and knead a few times until the dough is smooth. Shape the dough into a rectangle that is approximately 3/4 inch thick. Cut the rectangle into six squares. Cut each square diagonally to form two triangles. You should have a total of 12 triangles. Place on the baking sheet and bake for 12 to 14 minutes until scones are lightly browned on the bottom. Let cool on the pan for a few minutes. Dissolve one tablespoon of instant espresso into one tablespoon of very hot water. If espresso doesn't dissolve completely place mixture in microwave and microwave on high for 10 to 15 seconds. Add cream, half and half or milk and mix to combine. Add icing sugar and whisk until you have a smooth consistency. Add more cream or milk for a thinner consistency. Drizzle glaze onto scones while still slightly warm. 1. No need to go out of your way to buy buttermilk, you can easily use milk instead, just add 1/2 tablespoon of white vinegar or lemon juice to 1/2 a cup of milk. Let stand for 10 min. and then use as directed in the recipe. 2. The recipe for the glaze makes enough to drizzle on the scones and not to cover the entire surface of the scone. 3. Although best to consume scones right away, they keep well at room temperature for 2 days. You can also freeze leftover scones (best to freeze them as quickly as possible after having baked them to preserve their freshness). Thaw and warm up before serving. Scones are one of my favourite treats. I had to try these and am so glad I did. They turned out great! (I didn’t have any milk so I substituted greek yogurt.) Thanks for sharing this recipe. I’ll be making these again. I’m so glad you liked these scones Elizabeth! Good to know that yogurt makes a good substitute for milk in this recipe! Hi, yes they were delicious. Thanks! These scones sound wonderful, I love the combination of flavors! Thanks so much Nicole, I’m so happy you stopped by my blog! 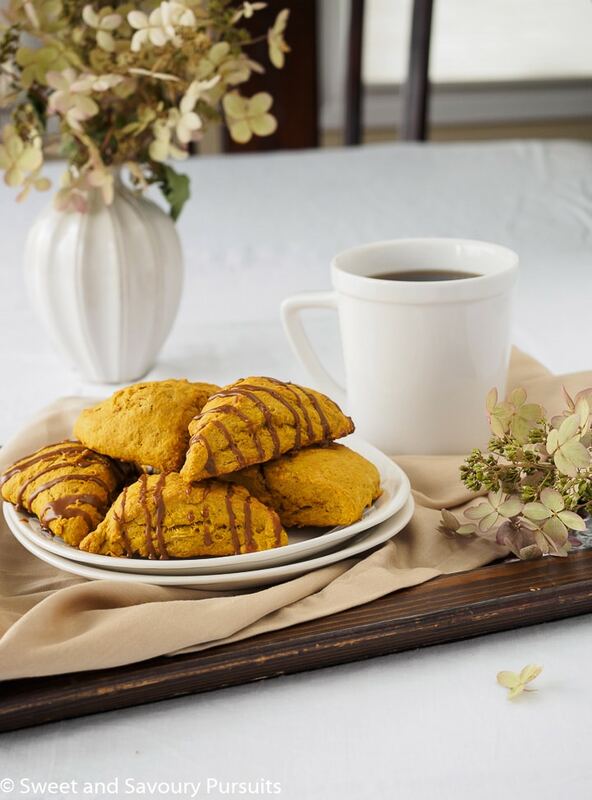 Scones make for such a wonderful breakfast and these pumpkin scones make for an extra special treat! These sound absolutely wonderful and I just love that espresso glaze! 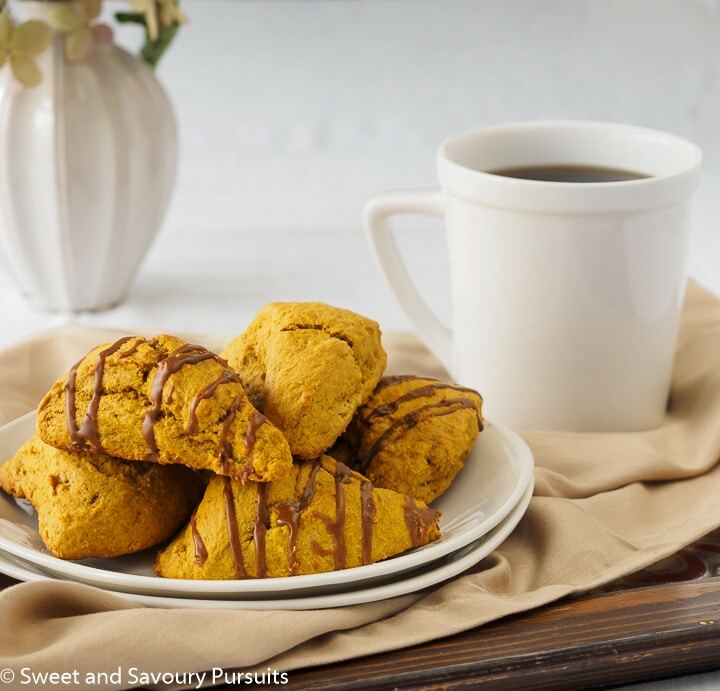 Pumpkin scones are one of my husband’s favourite treats! I must try these! Thanks Jessica, I hope you make them for him. I had frozen about half of the batch, took them out of the freezer today and warmed them up, they were as good as freshly baked!